Plan: To take a photo of Pipal tree which is worshiped across India. 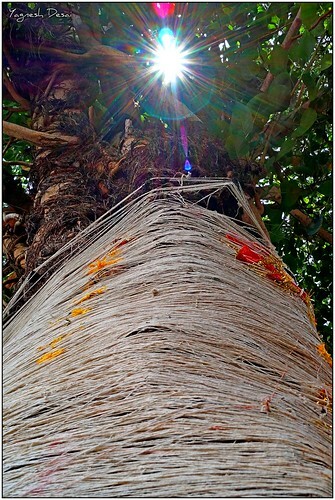 Story: Women worship this tree and ties cotton thread as a ritual and prays for the health and long life of their husbands. Went to one such tree near my house at the noon time hoping to get some good clicks of the tree under the shade. Once went there and saw up, found the sun appearing from the leaves. So composed this click. Learning: Got some details in the shadows done in post processing. Might be overdone a bit. 19: Seven lanes to haven.